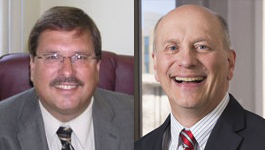 President Larry H. Dietz cordially invites you to a retirement reception honoring Chief of Staff Jay Groves and Vice President of Finance and Planning Greg Alt. Jay is retiring after 35 years of service and Greg is retiring with 27 years of service. The reception will be from 2-4 p.m. Thursday, April 27, in the Brown Ballroom of the Bone Student Center. There will be a program at 3 p.m.
Stop by and congratulate Jay and Greg on their esteemed service at Illinois State University.